This paper traces the contexts and trajectories of theoretical resources appropriated by Japanese folk religion or belief systems, particularly the notion of tsukimono, which is literally, yet unsatisfactorily, translated as ‘spirit possession’ in Japanese folkloric and cultural anthropological studies. In this paper, I consider recent studies in this field, including several of my own studies on Sado Island in Niigata Prefecture. I drew inspiration from Kondo’s (2013) concept of grappling with the ‘agency of the animal’. In addition, I explored the possibilities and appropriateness of applying Gell’s (1998) concept of ‘abduction’ in ‘art nexus’ to the field of folk religion. Furthermore, the relationship between theory and fieldwork are discussed, and emphasis is placed on the postcolonial shift in anthropology, which highlights the experience, voice, and meanings of indigenous peoples, as well as the researchers who work among them. This paper is a reply to Kiyoshi Umeya’s criticism on my 2013 paper. First, close reading of Takatoshi Ishidzuka’s work reveals that his view on post-war expansion of “tsukimono-suji”-related martial discrimination is influenced by the idea of impaired cultural survival. Ishidzuka concludes that people are not afraid of supernatural power of “tsukimono-suji” lineages or animal spirits, but they are afraid of peer pressure, which made them unable to stop martial discrimination. Second, Masanobu Kagawa’s “Culturally-institutionalized Story-Generating Device” should be carefully reexamined before being applied to analyze the relationship between snake spirits and a family in Okinoshima Town, Shimane Prefecture. This is because Kagawa does not provide enough support for the inter-generational transmission of the local magico-religious beliefs beyond the generation of people who grew up before Rapid Economic Growth. Third, I reiterate the process in which my 2013 paper was conceived in reference to contemporary Oki Islanders’ negative attitudes toward magico-religious explanations. My 2013 paper was an attempt to understand the local situations where some people openly question the supernatural potency of animal spirits, while some seem to take it seriously. 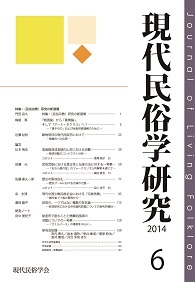 In the last chapter, the research strategies of “living folklore of animal worship” will be examined in relation to the conventional approach to “animal worship.” While the conventional approach was interested in reconstructing the original and authentically Japanese “animal worship” through various contemporary and documented examples, the new approach targets a contemporary example and tries to explain why certain people retained the relevance of animal spirits to their life. This paper investigates the production activities and household consumption patterns of a single household during Japan’s postwar period of rapid economic growth. In order to delineate their modes of livelihood and consumption, I analyzed a diary that includes income and expense data during the year 1963. It was written by the husband and wife of a household (A) involved in shifting cultivation in a Fukui prefecture village. As a result, three key points were determined: First, the division of family labor was specialized in order to earn cash income. Second, their pattern of consumption relates to the macro-scale political economy as seen in examples of shopping that depended on unemployment insurance payment cycles, choices of services and entertainment, and the way to spend time on New Year’s Eve. Third, consumption practices were embedded in local social relationships, especially family, as seen in the examples of the consumption of both ritual foods and novel foods as well as trips made to shop in larger urban center. These results suggest that studies of “economy” within folklore ought to pay more attention to modes of consumption. By doing so, researchers can focus on individual or family consumption as it relates to micro-scale social relationships and macro-scale political economy. A Study on the Authenticity and Traditional Method in Folk Entertainment: An Interpretation of the Folklorism of "Owara Kaze no Bon"
This paper makes explicit the authenticity and functions for maintaining the traditions of one traditional folk entertainment group. The folk entertainment is “Owara Kaze no Bon” of Yatsuo Town, Toyama Prefecture. Folk entertainment has been very successful as a tourist attraction. The traditions are carried on by a preservation society organization in the town. The problem for the preservation society is that it is short of successors, but it works hard to conduct activities that are rooted in the people of Yatsuo Town themselves. On the other hand, there is another group, which split off from the preservation society due to opposition to changes in the traditions. This group calls its own traditions “an original model.” They claim authenticity by refining the performance. Importance is placed on hin (quality of performance) in the skill examinations, and this acts as the function for maintaining the quality of performances. The group consists of people from all over Japan who are not from one locality, as are the preservation society. However, they are accepted as a preservation society by residents living in Yatsuo Town and by tourists. It is necessary to carry out research on folk entertainment by taking a fresh look at what we mean by regional characteristics. This paper is intended as a sympathetic critique of the cultural activities of Rekijyo–Japanese history buffs. A rekijyo is regarded as a female enthusiast who has an obsessive interest in historical figures. Some rekijyos are males, in which case they are often called rekidan. Rekijyos throw themselves into touring historical sites like palaces, temples, graves, and castles, as if they are on a pilgrimage. Sometimes they wear costumes there to portray a certain historical character or role. A rekijyo is also a self-educated amateur historian who attaches great importance to fieldwork. Their pilgrim-like activity is somewhat related to a romantic reaction to their academic or educational history. It is a way for them to resist the formal, dry and unemotional discourse on history that they experienced when they were younger. They prefer to empathize with their favorite historical characters than to analyze them. However, just like other Japanese youth, rekijyo culture is excessively postmodernized. Rekijyo also engage in an endless deformation and imitation of persons from history. Even though their view of history is based on empathy, their behavior is rooted in modern consumerism. Rekijyo culture is merely otaku consumption, but it is also a form of passive resistance against those who set themselves up as authorities on history. In contemporary China, we have seen the revival of lineage called Zongzu (宗族) and clan associations, particularly in the southeastern part of the country. From the late 1980’s, the lineages and clan associations have been actively conducting the establishment of ancestral halls called Citang ( 祠堂) and compiling genealogical books called Zupu ( 族譜), among other activities. In particular, the compilation of Zupu is of primary importance in reviving the lineages and the Han people have been tracing their genealogical roots with great enthusiasm. Before long, this movement spread to ethnic minority societies in China. By focusing on the case of the Long family ( 龍氏) of the Buyi people living in the Guizhou province of China, I will clarify how the current active movement of the lineage revival in the Han people societies influenced ethnic minority societies. Furthermore, I will examine this dynamics from the viewpoint of “sinicization”. Based on these analyses, I will shed light on new aspects of the lineage revival in contemporary China. This article critically examines the ontological commitment on which modern folkloristic studies of yōkai (a category of mysterious creatures in Japanese tradition) have been established. Academic yōkai scholars have assumed that yōkai are supernatural beings and that yōkai do not exist in mundane form. However, the adequacy of these assumptions when studying the world of people who does not share the same ontological framework as modern scholars has hitherto been of little concern in yōkai studies. Through critically examining the discourses and theories that have dominated yōkai studies, this article suggests that researchers have failed to understand the perspective of folk who recognize and co-inhabited with yōkai. Why have yōkai studies assumed this ontological commitment? There is a historical process continuing from the late Edo period on in which intellectuals and urbanites increasingly assumed what is now called yōkai to be supernatural and unreal. At the turn of nineteenth century, some scholars who sought to affirm the reality of yōkai began to juxtapose the supernatural realm against the backdrop of the rise of modern scientific empiricism in Japan. Furthermore, the presumed supernatural essence of yōkai was a perspective that had also slowly been adopted by disbelieving researchers. This article conceives this process as an epistemological rupture by which researchers can only understand different worlds or ontologies through the ontological framework generated after the rupture. This article proposes a “plural ontology” model that makes it possible for researchers to understand the diverse worlds in which people recognize yōkai. Until the 1950s, childbirth generally took place in the home. The proportion of hospital childbirths rose rapidly from the 1960s, and from the 1990s birth management associated with artificial medical intervention, the medicalization of birth, came to be seen as an issue. However, while childbirth in a birth center is one form of facility-based birth, as hospital birth is, since it offers the natural birth that women in childbirth seek, it is the opposite of birth with artificial medical interventions. I have implemented an interview survey with respect to the activities of Sakura Birth and women who have given birth there. It was clear that women about to give birth aspire to a natural birth without perineotomy, and that they are selecting Sakura Birth through information on the Internet or through word of mouth. The practicing midwives who are assisting in the birth are responding to the needs of these women for natural birth by improving the quality of their midwifery and guidance skills, as well as continuing to provide services such as recording the baby’s first cry and footprints immediately after the birth. Thus if we consider natural birth to be a form of consumer birth, then the “natural” birth mode becomes a commodity differentiated from “artificial” birth. The practicing midwife then becomes the provider of “natural birth” and various other mother-and-child services, and it is also possible to view this as a birth center business strategy in the present era of falling birthrates.